It's been a long time since Steven Spielberg directed a massive genre blockbuster, but with Ready Player One, he returns to that well. And in doing so, he's captured everything people love about old Amblin movies, but in a completely modern, visual spectacle that manages to uphold the spirit of the beloved book it's based on. Ready Player One is much more than Member Berries. This pop culture Easter egg hunt, which just had its world premiere at SXSW, is an absolute blast. Ready Player One takes place in the year 2045, where a massive wealth gap makes it so that the only escape for most people is a virtual reality simulation called the Oasis. The virtual world was created by James Halliday (Mark Rylance), who has recently died. But the influential figure who is basically the Steve Jobs of this world, but cranked up to eleven, has left behind a final game for Oasis users; a series of pop-culture related quests that, when completed, grant the winner control of the Oasis. Wade Watts (Tye Sheridan), with the help of some of his virtual friends like Art3mis (Olivia Cooke) and Aech (Lena White), will try to win the contest after becoming the first person to find one of Halliday's hidden keys within the game. However, the IOI Corporation is trying desperately to win Halliday's game and find his final Easter egg before Wade Watts and some of this fellow treasure-seekers, known as Gunters, can do it themselves. They'll stop at nothing to do so, which leads to some real-world danger as the hunt for the egg continues in the digital world. The fate of both worlds is at stake. Steven Spielberg is not only one of the greatest living directors we have, but one of the greatest to ever do it. Period. The man has made some of the most resonant blockbusters in history, both as a producer and director. He always seemed like the right guy to adapt Ready Player One for that reason and, as it happens, that turned out to be right. Even though he removed many direct references to his work and, for that matter, many of the pop culture references made in the book have been changed in general, he still absolutely captures what those references mean to the story with different characters and reference points. This isn't just an eye-candy filled, nostalgia trip. This is an excellent, action adventure movie that recalls elements of movies like Jurassic Park, E.T. and the best parts of Hook, in addition to movies like The Goonies and Willy Wonka and the Chocolate Factory, and wraps it all in a visually thrilling video-game-brought-to life-packaging. The tone is simply perfect. 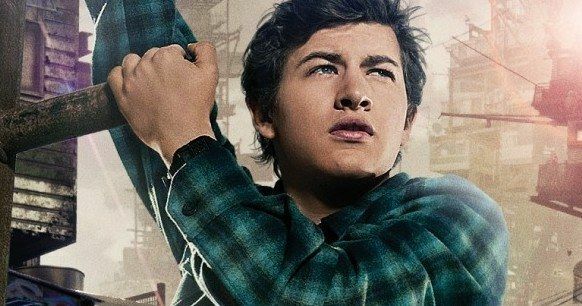 The marketing has done Ready Player One very few favors, but much of that has to do with the fact that they clearly didn't want to spoil many of the surprises contained within. I won't spoil any of them here, but I'll say that Spielberg adds a great many things that aren't in the book, but these surprises work so incredibly well on the big screen. He, along with screenwriter Zak Penn and Ernest Cline, who wrote the novel the movie is based on, reinterpreted and reimagined the material brilliantly for the live-action medium. To that point, Ready Player One is an absolutely beloved book, and there are going to be those who expect and want the movie to just be the book, but in live-action. That simply isn't what we get here. But books are not movies and movies are not books. What works in the book simply wasn't going to work on the big screen in many cases and the filmmakers had to find a way to keep the spirit of the novel alive while making the material work for this medium. If you go in with an open mind, I feel this movie will satisfy lovers of the novel. Most people who see Ready Player One, no matter how popular the book is, will not have read the book when they see the movie. And that's what's so great about what's been done here. This movie will absolutely thrill general audience members and should satisfy fans of the book as well. There's no homework that needs to be done. You don't need to be a gamer and you don't need to be a nerd to enjoy and love this movie. It's a great story and a great cinematic ride with a lot of laughs, emotion and excitement. It's a classic Amblin movie in that way. But those who want to get more out of it, keeping an eye out for Easter eggs and fun references, can get more out of it, but it's not a requirement. There's a great balance struck by Steven Spielberg in that regard. He cares about the story first and foremost. Even the most flashy set pieces, and there are some astonishing ones here, are in service of the story. Many people seemed to be writing Ready Player One off as a movie. Maybe it was some bad posters. Maybe it's because Spielberg has spent a lot of time making movies for a different kind of movie viewer as of late. But make no mistake, he was the right guy for the job and this movie should not be written off. Warner Bros., with the help of one of the greatest men to ever make movies, have made themselves a ridiculously fun movie that feels incredibly original, while also taking us on a trip down memory lane. Is Ready Player One Strong Enough to Repeat at the Weekend Box Office?